This month we are looking at the materials you will need for the "finishing" part of the marquetry process. What marquetarians mean by the word finishing is sanding and flattening the picture after it has been taken out of the press, and the application of varnish and the final rubbing down and buffing of the varnish layers. Let's assume that you've just taken your picture out of the press and the glue has cured nicely. Now you are ready to flatten the surfaces of the picture prior to grain filling and varnishing. Even though your picture has been in the press and the veneers look solidly flattened to the base board, if you run your finger tips over the surface you will feel plenty of small undulations and surface irregularities. Unless you are aiming for an impasto effect such as oil painter's use, you will need to flatten your picture so that, when your varnish is applied and has fully cured, you will end up with a picture that looks like it is embedded in a sheet of glass (unless you want to acquire a matt or satin finish, but we'll come on to that later). If a lot of veneer needs to be removed to flatten the picture, rather than starting with heavy grit sandpaper, I advocate the use of a cabinet scraper with a freshly sharpened blade. When used with care, scrapers can remove excess material quickly, without scoring the picture surface. 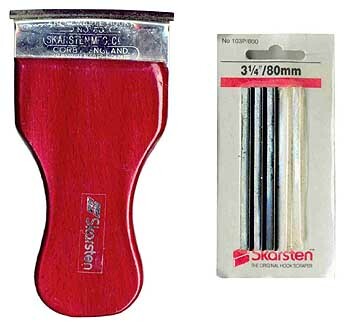 I purchased a Skarsten wooden handled scraper (shown at right), which has interchangeable blades or "hooks" that are pre-sharpened and shaped to the correct specifications. If you are adept at using traditional cabinet scrapers and are skilled at sharpening them, you have my genuine admiration. With the surface of your picture leveled with your scraper, you're ready to sand. 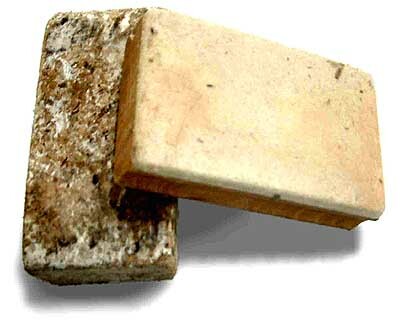 The first item needed is a cork block or a wooden sanding block with a felt covering on the contact face (shown at left). These blocks are essential for achieving a flat finish without valleys appearing on the surface of the picture. As to the sanding papers themselves, I usually use waterproof silicon carbide. The only problem is that they clog up quickly, so I normally prepare several blocks ahead of time. This clogging problem ceases when we are flattening the varnish layers, because we can then use the papers wet and their cutting power is unhindered. For the initial flattening stage, I recommend 300 to 400-grit paper. But take care not to use heavy pressure, because you run the risk of scoring the veneer and leaving visible scratch marks in your picture. For the intermediate stages I prefer 500 to 1000-grit paper, and then for the final flattening of the varnish I use the finest grades I can obtain, which is generally 1200 to 1500-grit. These fine grade papers are often available from an auto parts store. Keep in mind that you are not sanding solid wood. If too much pressure is used you will quickly sand through the veneer. If you use a power sander, take care because it's very easy to go right through the veneer layer and ruin all your hard work. Limit electric sanders to the initial sanding with a minimum of 600-grit or finer. Many veneers have open grain characteristics. This will eventually start to show through your varnish as it settles and cures over the first six months or so of its life. The answer here is to use a transparent grain filler. Cellulose-based sanding sealer comes as a clear volatile liquid. I have been told that cellulose wall paper paste will also do the job effectively, although I've never tried it myself. 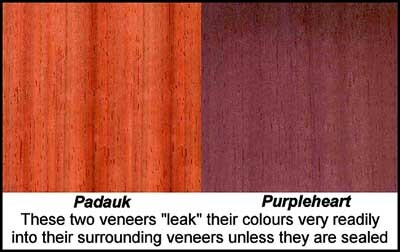 Sanding sealer also has the inherent advantage of preventing strongly coloured veneers like Purpleheart or Padauk (below) from contaminating nearby veneers with fringes of their color (a very nasty experience, especially if you are using light coloured veneers next to these strongly colored ones). Probably the easiest way to apply sanding sealer is with a brush, in the manner recommended by the manufacturers. Leave the picture to cure for a day or so, rub it down to flatten it, and then apply another layer of sanding sealer and then flatten that. Generally those two applications of sanding sealer are sufficient for the grain filling part of the marquetry process, although you can if you want apply several coatings of sealer. There is no real need to do this unless you wish to use the sanding sealer as your final layer, but it is a somewhat fragile finish, and more prone to scratches than other options. An extremely good varnish for marquetry is French Polish. This is one of those black art subjects that, if you can do it, the results are perfection - but if you hesitate while applying it or you get the proportions wrong, you end up having to sand your picture back down to the veneer. Luckily, you can now buy "brushing" French Polish, which comes in a bottle as a clear liquid that is just literally brushed on like paint. Four or five coats can be applied and allowed to dry before sanding with fine garnet paper. If you wish, you can add a couple of further coats so that you can build up an almost sheet glass finish. A favorite finish in Britain is a product called"Plastic Coating", which is made by a company called Rustins. This product may be available in the U.S. as a catalysed two-part, cold-cured, lacquer. It comes in a large container of lacquer and a small container of liquid hardener. When mixed, it sets into an extremely hard and clear surface that has a superb gloss and is virtually impenetrable. Some marquetarians swear by polyurethane varnish. The only proviso with this or any volatile material is that you must apply them in a WELL VENTILATED AREA, because the fumes they produce can be somewhat nauseating and possibly toxic. Read the labels. Clear acrylic is another option. It is more or less odourless and your brushes can be rinsed out in clean water. The acrylic works well, but the finish tends to sink after a few months and needs flattening and building up once again. So, be prepared to allow about a year to achieve your final finish. I discovered this problem to my chagrin at a National Exhibition where the varnish on my beautifully flattened picture had virtually sunk overnight while it was on display. Rather a red-faced time there, I'm afraid! For general use it is excellent, but for exhibition and competition purposes, make sure that you do your finishing a year before you place your picture on public display. In our next talk, we will investigate design work and suggested veneer selection for our first marquetry pictures. Until then, happy woodworking.